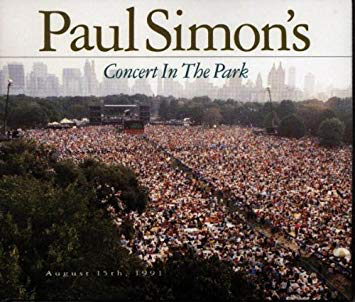 This is, along with 2012's Hyde Park concert, one of the best full concert live recordings from Paul Simon. While the sound on the 2012 one is marginally superior, I like this one because it includes six songs from "The Rhythm Of The Saints", an album I particularly love. They are all reproduced without losing any of that distinct atmosphere from their original recordings. There are also five songs from "Graceland". Simon employs a large band of African/South American musicians and what is quite interesting is that he allows them to use their distinctive styles on songs such as "Kodachrome" and "Cecilia", giving those songs a new, invigorating makeover. The backing vocalists are superb, throughout the performance. Check out "I Know What I Know". Wonderful. Straight of out Johannesburg's townships. The instrumental jam at the end of "Diamonds On The Soles Of Her Shoes" is marvellous. It is nice to hear a full, punchy version of "Train In The Distance", full of brass backing. "Hearts And Bones" as well. Other than that, and the "Rhythm Of The Saints" tracks, it is pretty much solo and Simon & Garfunkel hits all the way, however. There is an exhilarating, intoxicating live feel to the whole thing. The atmosphere comes across well. There is also a spine tingling moment when some jazzy, piano noodling suddenly turns into "Bridge Over Troubled Water" and the audience hoots and hollers. The band, unsurprisingly, is top notch and Paul Simon is, well, Paul Simon. The guy is special. Highly recommended.